One thing to consider is that the lens has a variable brightness, which means that depending on how much you are zooming the lens will have a different maximum aperture value. At 28 mm the lens brightness is f/3,5 and at 200 mm the brightness is f/5,6. Through the link below you can read more about what this could mean for you as a photographer. There is a lens hood that fits the lens (model name "EW-78D") but unfortunately this is something that is not included when purchasing the lens and must be ordered and bought separately, as an accessory. Text from Canon: "This is a very lightweight and compact zoom lens for its almost 7X zoom ratio. 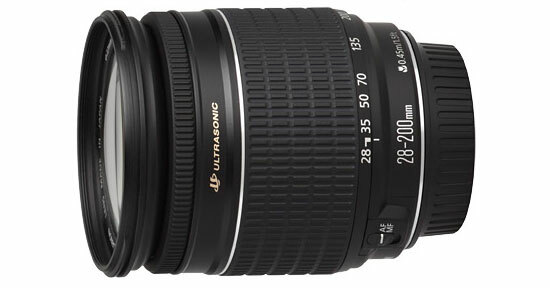 It is the first ever EF 28 to 200mm, made possible by the five group design with all five groups moving during zooming. It achieves the high zoom ratio while keeping the number of optical elements to a minimum by using two aspherical elements. Inner focusing using the second lens group gives focusing to 0.45m at all focal lengths and maximum magnification of 0.28X at 200mm. Inner focusing combined with the USM focusing motor give silent, high-speed focusing. Another advantage is that front-mounting accessories, especially polarizing (PL) filters are much easier to use since the lens does not rotate while focusing. The silver ring at the front of the zoom ring presents high-quality appearance, and the optical system uses only environmentally friendly lead-free glass."